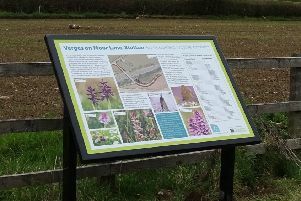 A farm in Upper Nidderdale is the latest to join a project by Yorkshire Water to transform farming practices to connect with the land, the water and the wildlife. As part of Yorkshire Water's ‘Beyond Nature’ vision project, the farm will not only continue to focus on traditional livestock practices that involve looking after 800 breeding ewes, but also widen its scope to become a more sustainable 'farm for the future'. As part of the project at High Woodale, a vitally important task is restoring peatland bog on the farm, which helps lock carbon dioxide in the land; helping to reduce the risks of global warming. The project will also involve creating a more sympathetic habitat to breeding wader bird species and will see two traditional hay meadows reinstated, which will allow for cattle to be introduced to graze it. Situated in the high moorlands surrounding Angram and Scar House reservoirs, High Woodale farm also plays a vital role in helping to protect drinking water quality supplied to the city of Bradford. By having more peatland, and specifically sphagnum moss, improves the quality of water collected on the moorland by reducing soil erosion, which can discolour the raw water collected in both reservoirs and requires expensive treatment to remove. Farmer Martyn Brown who has managed the farm since 2002 said: “We will continue to work hard up at High Woodall to improve as much of the land and wildlife habitat as we can. "This I feel is vitally important as generations of farmers before have proved that, if you maintain and care for your land and wildlife, in turn they will look after you. The area has a strong cultural heritage too, with several archaeological remains from the lost medieval hamlet of Lodge. As part of the Beyond Nature Vision, the cultural heritage of the site will be protected too, by working closely with the Upper Nidderdale Landscape Partnership. High Woodale joins Humberstone Bank Farm in the Nidderdale Area of Outstanding Natural Beauty in becoming a Beyond Nature farm, but there are plans for more farms in Yorkshire to join the project in the coming years.